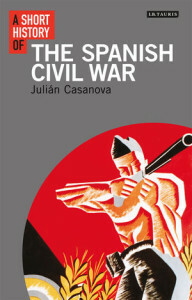 In this book in little less than 200 pages plain text professor of History at the University of Zaragoza Julián Casanova gives a concise but intelligent and broad overview of the Spanish Civil War and its causes and consequences. Casanova begins with explaining the deep divisions that existed in Spain before the outbreak of war, in secular political life as well as in religious affairs. In six chapters professor Casanova deals with the main protagonists of the struggle, zooms in on the Nationalist as well as on the Republican side and explains why and how the Spanish Civil War came to be. The role of the Church in the conflict is dealt with in the beginning of the book and a considerable proportion of the text is reserved for this important aspect of the war. Casanova explicates clearly why and in what manner the religious hierarchy chose to side with the military rebels from practically the beginning of the war. The secularisation programme of the Republic was the most important reason for this. The separation of Church and State and the secularisation of schools, and education in general, robbed the catholic church of her former influential position to affect social life and society. The actual course of the war is told by the author in two separate chapters, each dealing with one of the fighting parties. The Nationalists were from the beginning of their insurrection not quite so united as some might think. However, due to Franco’s scheming and planning, and a bit luck since other more obvious possible leaders of La Causa died or were in Republican prisons, he managed to obtain supreme command over all Nationalist forces. He also unified all rightwing movements in the nationalist zone into one Moviemento Nacional and became Head of State himself. For that matter fellow-insurgent General Miguel Cabanellas was right when he warned his colleagues the moment they would bestow on Franco the supreme leadership of their movement that he would not share it until his death. While talking of the Republican war waging, Casanova hits the right note when pointing to the internal divisions that ripped the Republic apart. Nationwide with the tension between the communists and the anarchists, as well as inside the government itself, where Largo Caballero had to leave the stage for Negrín, who later on in the war felt obliged to sack his former comrade-in-arms Prieto for his defeatism, or realism, some would say. This internal division caused the Republic’s undoing together with, most important, the unilateral international policy of non-intervention, that ensured the Republic would not receive international aid and at the same time did nothing to stop the fascist powers Germany and Italy helping Franco. It turned out the fear of many liberals in Europe’s western democracies for the ‘communist red Spain’ was a self-fulfilling prophecy; precisely because practically the only nation that provided help to the Republic was Stalin’s Soviet Union, the communists within Spain could develop an excessive influence and importance in governmental affairs, which in turn led to an ‘I told you so’ mentality in Europe’s still sleeping democracies. Foreign aid on Franco’s side and a strangling non-intervention policy on the Republic’s were, ultimately, ensuring Franco’s victory and the Spanish Republic’s defeat. All in all Casanova’s book in the I.B. Tauris Short History Series can be called a great success. In Casanova’s work the general reader will find a perfect and compact introduction into the complicated subject of the Spanish Civil War, for those with more knowledge of the war and its historiography, Casanova engages enough theories and interpretations by other authors to hold on to that reader’s attention also. In powerful prose Casanova wrote a scholarly history of the Spanish Civil War, and although his tone leaves no room for half-hearted francoist pseudo-historical writing, his writing remains unprejudiced. After reading this volume in the Short History Series, one is curious to discover more parts of the series!